The explosion in retro toy nostalgia was always going to catch up with the R/C car hobby, and it was inevitable that a few of the bigger brands would delve into their past to release new versions of their popular cars of the 1980s. I’ve written in the past about Tamiya’s foray into this. And in recent years, the second most famous Japanese R/C kit maker, Kyosho, has followed suit. 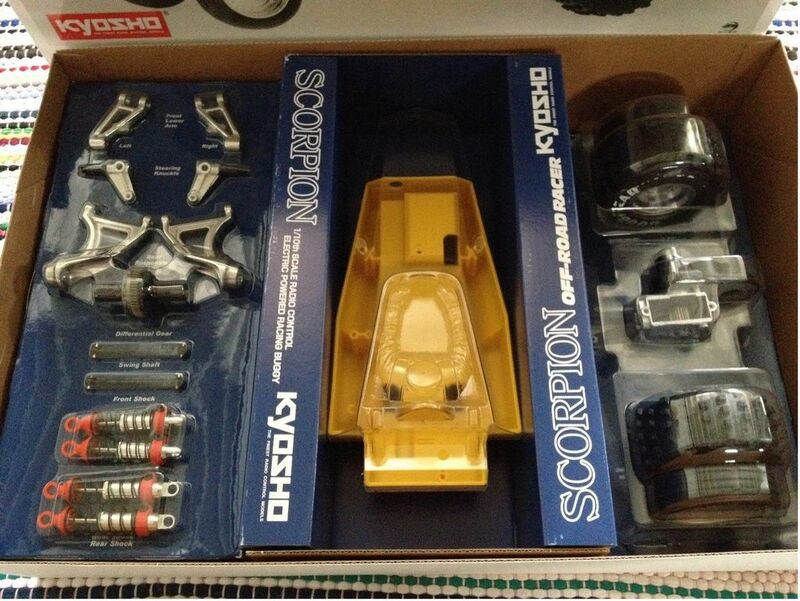 Early Kyosho R/C cars were works of art in construction, performance and even packaging. Their involvement in R/C actually pre-dates that of Tamiya. But Tamiya produced electric R/C cars first, with Kyosho starting a year afterward. Many people have a great fondness for Tamiya’s iconic white R/C kit boxes with their hand-drawn illustrations. Kyosho meanwhile, did things a little differently – their models were beautifully photographed and colourfully packaged, making them every bit as inspiring if you were a kid gazing up at those huge car boxes on the shelf at the local hobby store. Inside, they featured blister pack displays of fat sand dune tyres, often lots of metal parts, and plenty of realistic touches like driver figures, decals, headlights and window netting, making them a joy to build. Components were well made and sometimes embossed with “Japan”, even on metal. Kyosho was a company proud of it’s miniature engineering skill. And out on the racing tracks, there were certainly periods of time in the 1980s when Kyosho buggies were the ones to beat. 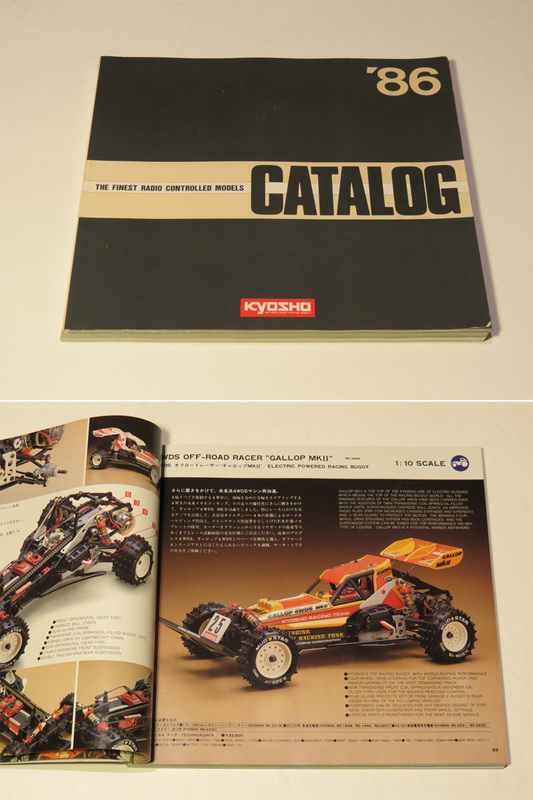 The 1986 Kyosho Catalog is considered a great showcase of their products. It was packed with photos of the vast R/C range they had, including many of their most memorable early R/C cars. With Kyosho continuing today as one of the few surviving R/C companies with a history dating to the hobby’s boom years of the 1980s, inevitably the company has seen fit to reproduce some of those classic 80s kits as a tribute (and to earn a few extra dollars from the popularity of nostalgia in the wider toy and hobby market). The remake Kyosho kits are nicely presented, and on first glance they even look quite similar to the original kits. They are definitely worthy if you are interested in re-living the look of vintage R/C models, without owning cars that are actually from the 1980s. Like so many products out there these days, they are by definition “retro style”. But as with Tamiya’s remakes, closer inspection reveals that the new Kyosho remakes are also quite different to the original models. And since plenty of original Kyoshos are still out there being traded, this article is a quick summary of the basic differences between those original Kyosho R/C kits of the 80s and the new retro tribute kits – should you wish to go on a treasure hunt for an original. If you’re already an experienced hand at collecting vintage R/C cars, this article will be too basic for you. It is aimed mainly at those who are just getting into vintage R/C, and are interested in learning about the original models, and knowing the basic differences between them and the remakes. In short, every single Kyosho remake kit is different to the original kit. 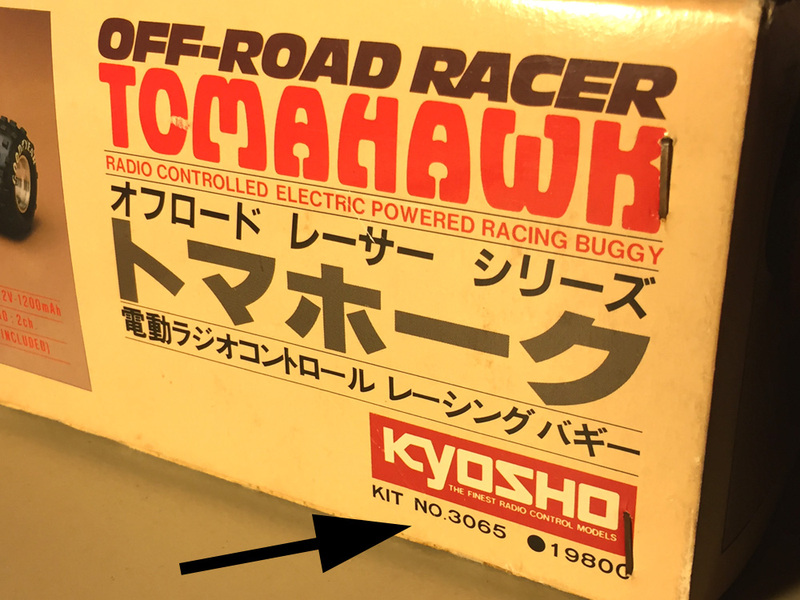 From the price, to the box art, to the kit contents, it’s easy to spot an original Kyosho once you know what to look for. Recent years have seen the market for collectible vintage R/C cars mature somewhat. Initially, when the very first remake kits began to appear in the mid-2000s, they did have an effect on the market value of the original cars. But as the years have passed, the market has matured and most collectors have accepted that nothing ever replaces “an original”. Thus I think originals are more easily holding (and increasing) in collectability/value these days, regardless of whether a corresponding remake kit has appeared. I say this from personal experience of buying, selling, and watching market prices literally daily, year in and year out. In the longer term, original kits really have nowhere to go but upward in price. They’re the originals. Nothing ever beats having an original, to a collector or serious enthusiast. And the number of examples left in the world that are brand new or in excellent condition, will continue to dwindle with time – ever so slowly. Because inevitably each year, a few minty original cars somewhere in the world are going to be built, run and enjoyed by their owners. And there’s no harm in that. It just means, on a purely statistical level, that fewer mint examples will exist. 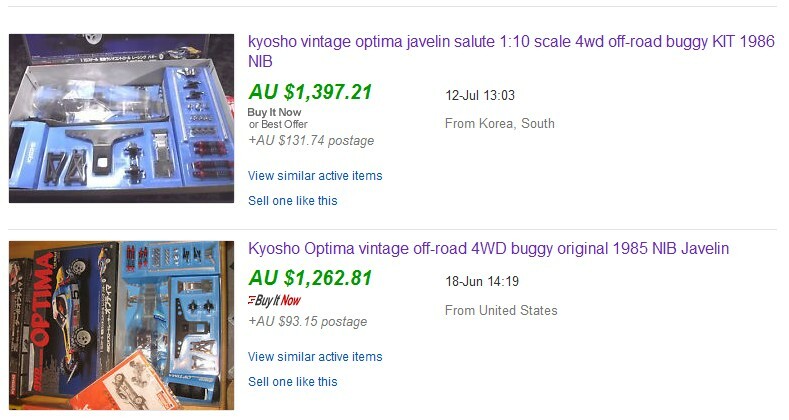 So as a general rule of thumb, an obvious way to spot an original Kyosho R/C car is if it has a much higher price. As a general rule, original kits are worth at least twice the value of the remake kit. But they might be as much as 3, 4, or 5 times more valuable, depending on a particular model. 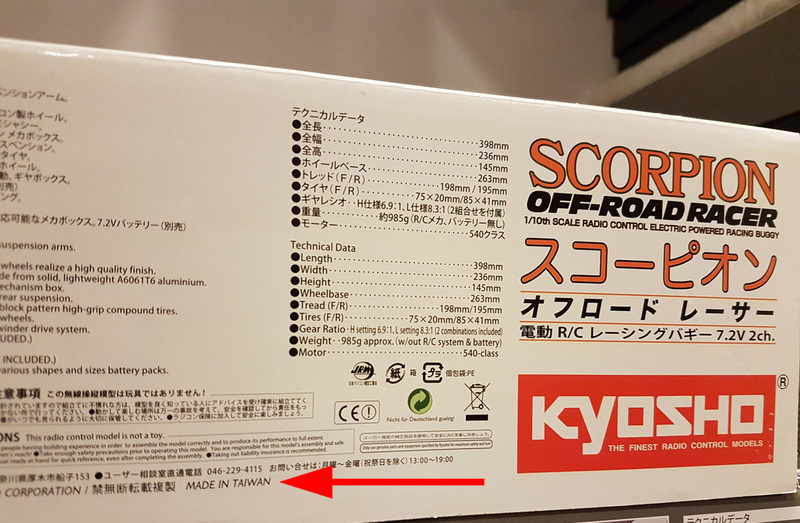 The model number of original Kyosho kits can be found on the side of the kit box. Just like Tamiya remakes, Kyosho remakes are not “repeats” of the original models. They are newly made models with new Kyosho model numbers. At the time of writing, Kyosho has remade 4 models – the Scorpion, the Beetle, the Tomahawk and the Optima. Any honest seller of R/C kits will be up-front about which model number they are selling. Another easy way to spot an original vs remake kit, is the box itself. Not just the model number, but the box photo. Kyosho kit boxes have almost always used actual photos rather than illustrated box art. 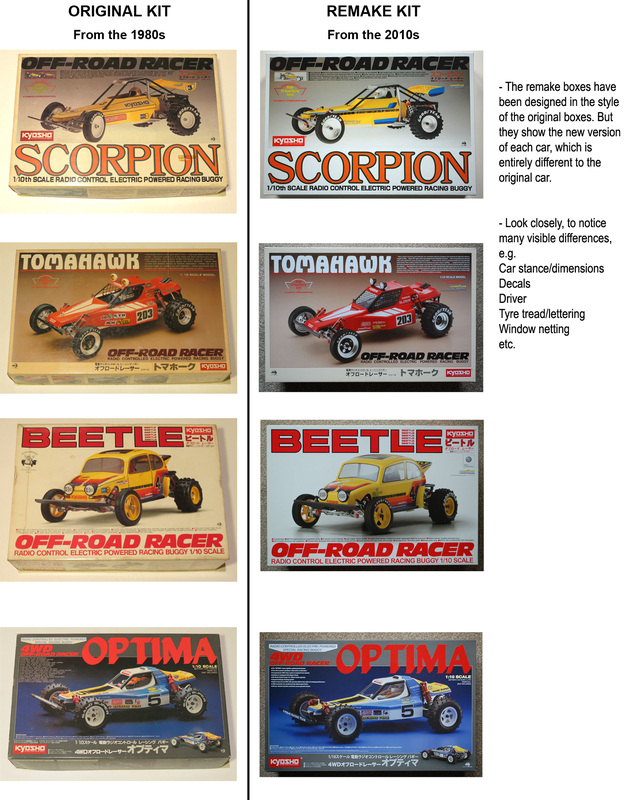 The Kyosho remake box photos attempt to emulate the look of the original boxes, using photos of the new cars. But since the cars themselves are entirely recreated from new molds and with new parts, the photos are different. 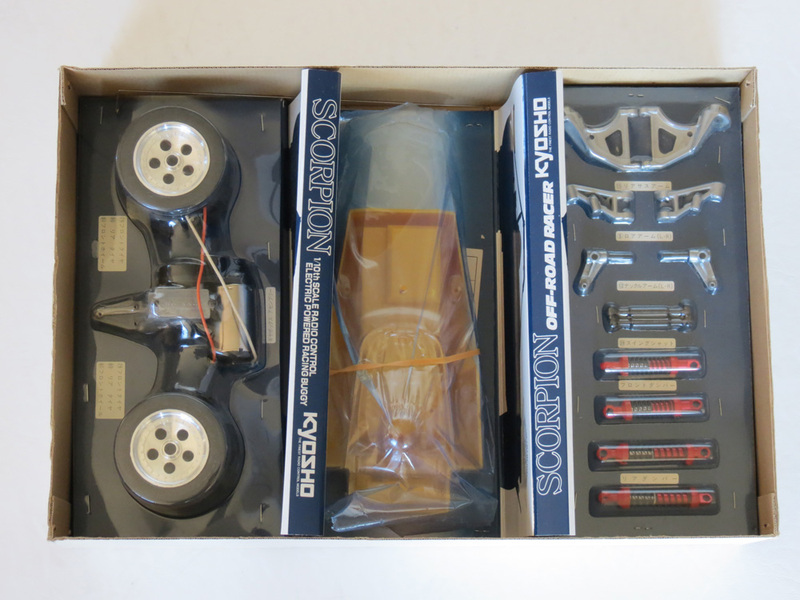 A quick look inside a Kyosho kit will also reveal whether it is vintage or remake. Provided you know what to look for. All Kyosho remakes are made in Taiwan. Not Japan. Another change is that in the old days, all Kyosho products were manufactured in Japan. You could always see “Made in Japan” on the boxes, and some of the parts even had “Japan” embossed on them, such as the rear gearbox of this model. But today, most Kyosho products are manufactured in Taiwan, Republic of China. Certainly all of the remade Kyosho kits are made in Taiwan. So if you see Taiwan mentioned anywhere on the box or parts, this means the kit is a remake. Last but certainly not least, are the actual parts differences. Virtually none of the parts in the Kyosho remake kits are identical to the original parts, and there are two reasons for this. The first is that the new models are made from new molds because Kyosho no longer has the original molds from the original kits. The second reason is that the new models have been redesigned for different performance to the originals, and are designed to handle newer equipment, batteries and motors. First, here are the original tyres. They are made from a hard-wearing compound. They have alternating 3 and 4 larger knobs per row of tread. They have raised/embossed “Goodyear” tyre letter outlines that you can colour-in yourself with white paint. (Note also that some original kits may have “Sand Super” as the sidewall writing). Now here are the remake tyres. They are not “repeats” of the original tyres, but rather, entirely new tyres made from different molds and with a different material. They are made from a different compound. Many buyers have said they have a strong chemical smell when you take them out of the kit. They have alternating 4 and 5 smaller knobs per row of tread. The white tyre lettering comes pre-sprayed and has no raised/embossed outline. Many examples arrive with the tyre lettering paint coming off. And with no outline, it’s hard to touch up. Kyosho have done a good job with their remake kits, paying homage to the original kits with a line of new cars that emulate the spirit of the originals. They have been met with a positive response by many, and as with all ‘retro’ products, if you’re happy with something that just looks vintage, they’re the ticket. For those who’d prefer the truly vintage original cars though, they can still be found. The original cars also differ significantly from the new kits, which means they will forever remain unique and highly sought-after classics of the R/C world. So if you’re on the lookout for them, your mission will remain a highly rewarding one.